Based on a proven design, but refined and updated with enhanced features, it has the power and performance to satisfy even the toughest job requirements, due in part to the MIL-STD 810 & IP54/55 weather-proofing. A model of ergonomic excellence on the outside, inside it's packed with such features as priority scan, built-in VOX and a voice scrambler. No wonder the smart new TK-2302/3302 is attracting such attention. Built tough to take rough treatment in its stride, the TK-2302/3302has passed the demanding IP54/55 dust and water intrusion tests, both with and without the KMC-45 optional speaker microphone. It also meets or exceeds 11 stringent MIL-STD 810 C/D/E/F environmental standards, including “driven rain”. So whatever the weather, the TK-2302/3302 is ever ready for action. The radio's encoder/decoder function uses QT/DQT to segregate talk groups so you only hear calls from your own group. The 5-tone encoder function can send 5-tone ID to another radio with 5-tone decode. The rotary and key controls on the radio can provide voice confirmation of radio status or operating mode, which is convenient when you are not able to look at the TK-2302/3302 – for example, if it's in your pocket. English is the default language, but you can switch to French, German, Dutch, Italian, Spanish, Russian or Chinese. 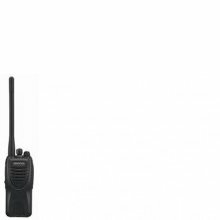 The TK-2302/3302 provides ample capacity for operating with multiple channels or radio systems.